18-19. 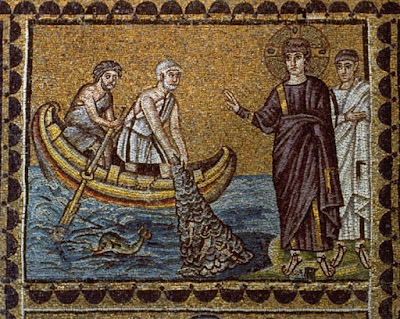 As He was walking by the Sea of Galilee, He saw two brethren, Simon called Peter, and Andrew his brother, casting a net into the sea: for they were fishermen; and He saith unto them. 19-20. 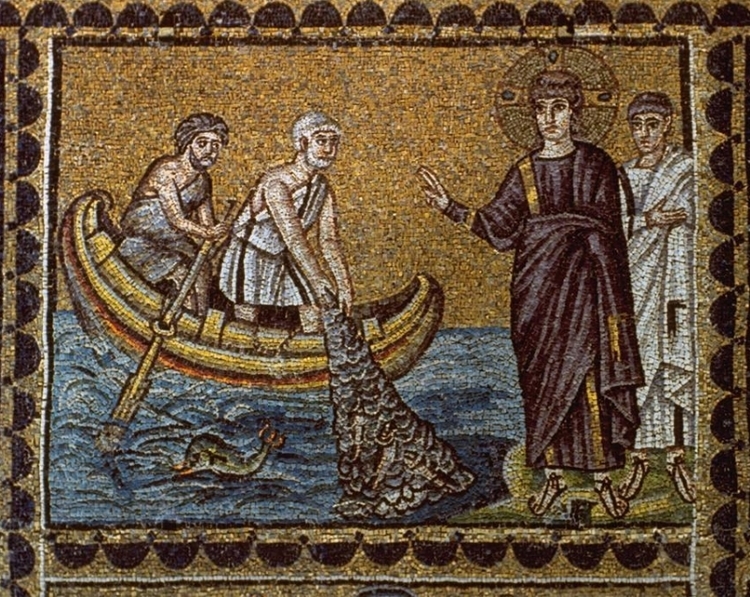 "Come follow Me and I will make you fishers of men. And they straightway left their nets, and followed Him." Behold obedient men, who followed Him immediately. From this it is clear that this is the second time that He called them. For they had been taught by Christ on a previous occasion [see Jn. 1:35-42], then left Him, and when they saw Him again followed Him readily. 21. And going on from thence, He saw two other brethren, James the son of Zebedee, and John his brother, in a boat with Zebedee their father. It is the greatest of virtues to care for one's father in his old age, and for the father to be supported by the just labors of his sons. They were poor and as they were unable to buy new nets, they were stitching together their old ones. It appears that Zebedee did not believe and it is for this reason that they left him. Do you see when it becomes necessary to leave one's father? When the father becomes an impediment to virtue and reverence for God. When James and John saw the first two follow Christ, they rightly followed Christ as well, imitating their good example. 23. And Jesus went about all Galilee, teaching in their synagogues, and preaching the Gospel of the kingdom. Jesus enters the synagogues of the Hebrews to show that He is not opposed to the law. And healing every disease and every infirmity among the people. He begins with miracles, to give credibility to what He teaches. By disease is meant chronic illness, and by infirmity, a temporary bodily disorder.